Ok...I have made it no secret that Fall is my absolute favorite time to visit Walt Disney World. You have the races, the meet ups, Mickey's Not So Scary Halloween Party, the fall foliage, the low crowds, and of course, a newer, to me at least, but just as amazing event, Epcot Food and Wine Festival time! I, luckily enough, have been blessed to be able to go to this event the past two years by myself and I can't wait for the day when Brian and I live down in Florida so I'll finally be able to take him! This is honestly one of the most fun events in all of Walt Disney World each year. With this year's events rapidly approaching, I thought it was the perfect time to talk a little more in depth about this glorious "holiday". I will admit, the first year planning was a little scary and a lot overwhelming. How was I supposed to know about everything that took place during the event? Unfortunately for me, my quest for learning about the details was my own method of self discovery. Fortunately for you, that is not how you will have to learn about the ins and outs for this event. 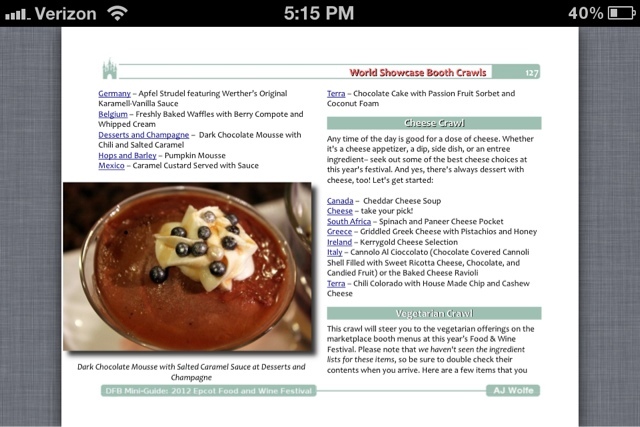 You see, AJ Wolfe, from the Disney Food Blog, has created these amazing resource e-books all about the food and beverages that surround Walt Disney World and she just created a new book that is exactly what any one who is going to this year's Epcot International Food and Wine Festival is going to need. 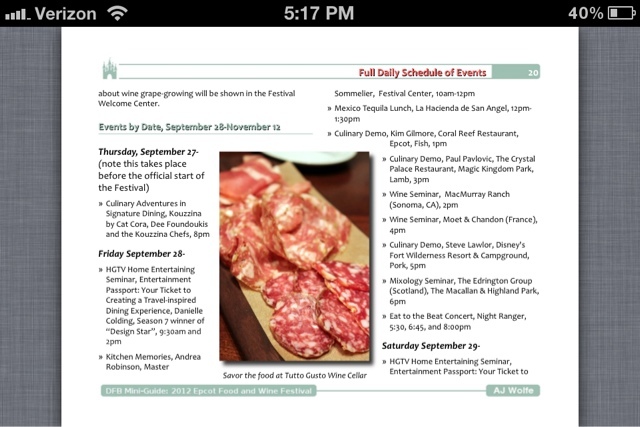 My first thought about the e-book was, this is really only going to come in handy for first time visitors to the event. And yes, let me tell you...if you have never been to the event, this is something you NEED to pick up and have on your smartphone while you are down in Florida for this year's festivities. But let me tell you...I know now that this book will come in handy for the veterans of Food and Wine too. Through this book, I learned a thing or two that I had no clue about! There was just so much great stuff included in this book. You have an introduction of what the Festival entails for the newbies and you have information about what's new for the seasoned veterans (up until the time when I read this book, I had no idea there was going to be a Watermelon Patch for the kiddos!). 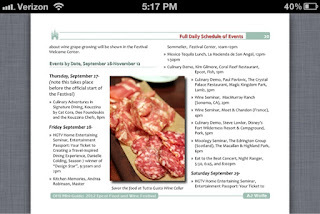 Another great thing that is found in here is information about all the signature events that are taking place. I was so impressed that the info is spelled out day by day of all the activities that are happening during this 46 day event. There is information about every seminar that will be taking place and every special event that will be offered as well. Of course, these are things I never have any real time to do, since my trips during Food and Wine are such go-go-go vacations, but for those who manage to get to participate in these events, it will certainly help in your planning process. What really impressed me about this e-book was how each marketplace booth is spelled out as to all the different offerings they'll have, as well as photos of some of the items being sold. This is huge for someone like me who maybe thinks something sounds weird when it's described, but the picture makes me decide, you know what, I want to try that! I almost wish there were more photos showing absolutely everything that the event would be selling! 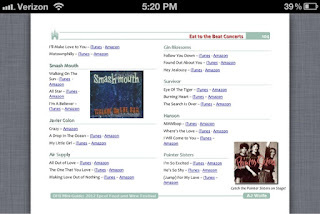 (Tip for AJ's 2013 edition!) Honestly, this right here is probably the biggest selling point in why you should own the book. There is nothing more handy than having a tool like this at your disposal while you are touring around Epcot, trying to figure out what menu items you should purchase and which ones are on the maybe list. Finally, for those who are on the look out for the Foodie rock stars (and by that, I mean the celebrity chefs that will take part in this year's event) there is detailed information about them too, explaining a little bit about their backgrounds. 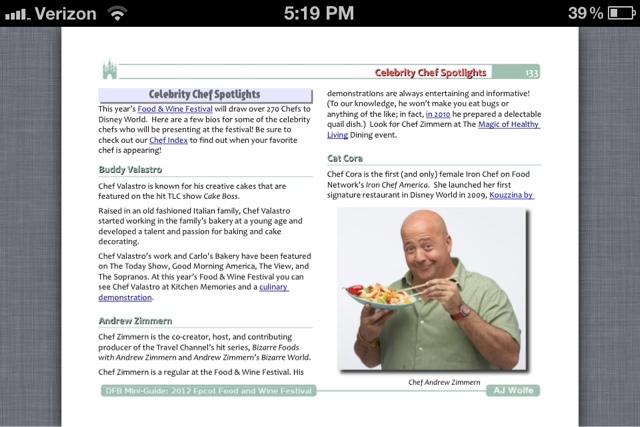 Now, this is one of AJ's books, so you can't forget one of her famous portions of any of her books and those are the food crawls that are included. If you are on a mission to sample different cheeses or desserts, or even a kid's tour with food samples picked out specializing in just those specific items from the marketplace booths, AJ's Food Crawls are THE PLACE to make sure to accomplish that, along with have a little fun too! Also included is information about the different races that will be held surrounding this event, the new Tower of Terror 10 miler and the Wine and Dine Half Marathon. There are details found here about anything and everything related to these two races. 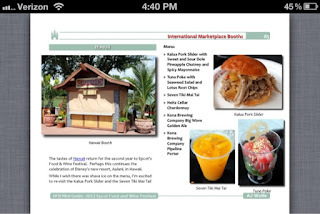 Would I recommend the DFB Mini-Guide: 2012 Epcot Food and Wine Festival e-book? Of course I would! It is honestly the go to book for anyone who will be travelling to Disney during this time period. Even if you aren't planning on spending a lot of time at the event, it is still a must read. And trust me, if all you plan to do during your Disney vacation is nosh and explore during the Food and Wine Festival, well, then I don't have to tell you what a great tool this book is for you!